Has the West entirely lost its position as a moral compass after Mosul and now the Homs attack? What is really going on in Iraq and Syria, where U.S. troops are building up? And who is really running the EU? The U.S. bombing innocent civilians in Iraq by the 100s; Israel blocking human rights workers in Gaza; EU says "no more refugees…We're at the limit." Just 20 years ago if you were to hear such headlines, you would be dumbfounded into a state of shock. But today, the West no longer positions or even aspires to be the moral compass for the rest of the world. It's clear that we are beyond this tipping point now. The so called backward, third world and its despots can no longer astound us with appalling human rights accounts when the EU can always trump them with an ace card: we financially back these dictators. "He may be an SOB, but he's our SOB" was the CIA's explanation as to why it supported Mobuto in Zaire in the 1960s and 70s and this same doctrine is alive and well both in the U.S. and EU around the world. Corruption, greed and dirty deals now play a much more prominent role in geopolitics though and with the collapse of western media and journalism in general – replaced by the cabal of bloggers, citizen journalists, activists, hackers and the deep state – it isn't too hard to see the filth of decadence and personal fulfillment, mainly because people are not shocked anymore by it, so those guilty of it hardly make the effort any more to cover it up. The Pentagon paying a British PR company half a billion pounds to produce fake news for Iraqi TV? The EU voting in its farcical parliament to increase subsidies to media outlets to produce more coverage [read fake news] of the EU? The British government blithely soldiering on with improving relations with Gulf Arab states who are either bombing thousands of starving women and children in Yemen – with weapons they bought from U.K. firms - or supplying arms to opposition groups in Syria. It's a sad detail of the Obama administration, but despite tying his colors to the mast of the Iran deal, he also signed off deals worth $100 billion of arms to the governments of Saudi Arabia and Qatar. And no one – not even the staunchest supporter of these Gulf Arab elites – believes for one moment that none of those arms made their way to extremist groups in Syria. But what is really happening in Syria? Powerful geopolitical plates shifting as new deals are mulled? Sort of. In reality what is happening in Syria is big business. Peace brokering has made some progress in recent months, thanks largely to the Russians. But it will be business deals – and those behind them – who will ultimately bring peace to Syria, that is, of course, if the Americans can restrain themselves from any further intervention, following the chemical attack on Idlib. While Turkey offers its support to any campaign to oust Assad, the Trump administration continues to mull the old idea that the Syrian president is better out than in, for all businesses concerned. 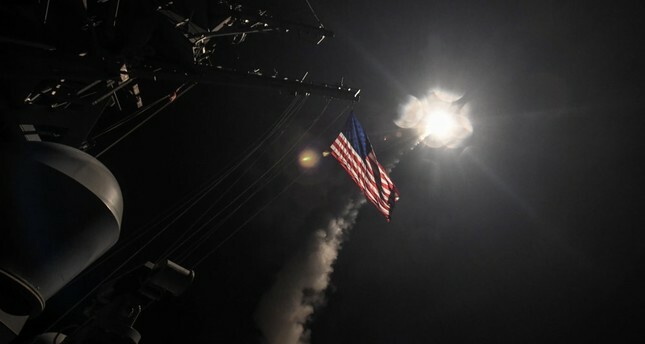 But if the U.S. goes ahead with a fresh attack on the Assad regime, it will be like a full circle being completed. Big Business finishes the war that it started. Many regional analysts have argued that it was big business that really provided the impetus for the war to really get under way in the first place. Two competing pipeline deals – one from Iran and the other from Qatar – both intended to cross Syria and enter Europe via Turkey had both the U.S. and Iran (and Russia) pitted against each other. Many argue that it was inevitable that Assad would be outcast by the West as he favored the Iran pipeline. But big business is back. Faster than you can say "the Clinton Foundation is coming," we are seeing the big deal emerge in Syria. It's no surprise that in the past two months the EU has made two proposals of huge cash "solutions" to Syria – both to the incumbent government but also to the opposition, including even extremists. Bizarrely, Brussels with no mandate of foreign policy – other than giving cash support to despots in Africa (which fuels the refugee flows via Libya) and occasionally dumping bags of rice out of the back of a Hercules jet – now believes, hilariously, it can make the leap to being a peace broker in Syria. This is the same EU that couldn't solve any of its own conflicts in its own back yard – Yugoslavia, Northern Ireland, Northern Cyprus, Ukraine – let alone stop terrorists from Syria entering the EU and bombing Brussels and Paris. Yep, the same EU that has such an abysmally low credibility in the Middle East that it wasn't even invited to any of the Syria peace talks now apparently has the blueprint for peace. Yes folks, here it is. A communication. A document with a lot of clever ideas written on nice EU letter headed paper. WHO IS REALLY RUNNING THE EU? But why does the EU keep on pushing for its role to be taken more seriously in Syria. Brussels is going through a dire crisis of confidence, which is unprecedented. And the more refugee stories that keep making headlines in Europe, the more the EU elite cringes when it sees in the same stories that the EU is not at all involved in being part of the diplomatic solution in the Middle East. Brussels is panicking. And it's not just the EU "civil servants" who are getting scared but also the real power behind Brussels: Huge, powerful multi nationals who often are not even European, but entirely run, to their own benefit, the European parliament. These companies are also worried now that if the EU collapses, then their sweetest of all sweet deals – to more or less draft the amendments to EU directives before they get voted on, so as to force out competition from smaller companies – will finally come to an end. What the EU foreign affairs lady in Brussels is trying to do is to position the EU as a global peace broker. And after working in Brussels for 11 years, I already can see the lies that Brussels would feed its journalists if its 'cash for all' plan, or even its more 'we can build roads and do election monitoring' one was agreed to, in any way. The EU often lies to its poodle journalists camped in Brussels. In 2006, after I returned to Brussels from Beirut after Israel agreed to stop its bombing campaign, I was shocked to see Italian soldiers disembarking from troop carrying vessels in Lebanon was reported as an EU victory – despite Italy sending its soldiers there under its own auspices with no EU direction whatsoever. The EU will do the same if its stupid communication gets clogged up in the diplo wrangling among the real power brokers, Russia and the U.S. Roads will get built. Probably with EU money. Election monitoring will be carried out by Brussels people wearing those ridiculous blue jackets. And the EU-bribed media will then rock up and film it as an EU victory. And so a Syria solution could be a life saver for the EU just as Iraq is for the Trump administration. And big business, warts 'n' all, is also showing its ugly face there. Just as the Clinton Foundation and all of Hillary's cronies in big business made a killing in Haiti, the Trump administration is rubbing its hands with glee in Iraq. Right now. The liberation of Mosul is all about big business and not about doing the world a favor and killing off Daesh so mum's can do the school run in Ohio or Oxford confident that Brussels or Paris can never happen again. Trump's recent, new improved relations with Iraqi Prime Minister Abadi is not just about bringing Iraq back into the U.S. fold, denying Iran the power that it only recently had over the entire country. Trump's own cronies in Washington want to make money in Iraq and, according to a recent investigation by British academic Nafeez Ahmed there are already plans that the U.S. president has agreed to, which gives western Iraq its own autonomy – and U.S. firms close to Trump naturally get all the resources and big deals. The break up of Iraq will be Trump's signature in the Middle East. In Syria, he may well have to accept a division of sorts that gives swathes of land in the North to his own business machine, while the rest goes to Russia. The EU of course keeps waving the check book at both Putin and Trump screaming "look, you can make billions there in reconstruction deals and you don't even have to pay for infrastructure...we'll do that for you!!" So, Russia and Chinese companies are likely to clean up in at least half of Syria when the Big Deal can be agreed. But the message is there for the 21st century. Huge geopolitical powers do not make peace deals. Big Business does that on its own. All the EU does is write the veneer of fake news which cash-strapped western media will pump out to its viewers without even checking, while the super rich laugh all the way to the bank.